Germany's foremost shipbuilder, the Blohm und Voss Schiffsweft of Hamburg, established an aircraft manufacturing subsidiary on 4 July 1933. It was this youthful and relatively inexperienced concern that was selected by Deutsche Lufthansa (DLH) in preference to the immensely more experienced Dornier and Heinkel companies for the development of a transatlantic flying boat only marginally smaller than the Dornier Do X. By 31 May 1937, when the Hamburger Flugzeugbau - As the Blohm und Voss subsidiary was then known - submitted its Projekt 54 transatlantic flying boat design study to DLH, the company had still to celebrate its fourth anniversary, and its practical experience with waterborne aircraft was limited to two prototypes of its first seaplane, the Ha 139. Nevertheless, on 19 September, the Hamburger Flugzeugbau was recipient of an order for three flying boats. The definitive DLH specification called for luxurious and spacious accommodation for 24 passengers by day, with an alternative arrangement for 16 sleeping berths. While this was being finalised, a thorough evaluation of the hydrodynamic characteristics of the proposed planing bottom of the new flying boat was undertaken with models by the Deutschen Schiffsbau-Versuchsanstalt (DSV). This planing bottom was novel in that the length-to-beam ratio was 8.4 compared with the generally accepted ratio of the order of 6, this having been selected by the Hamburger Flugzeugbau team, headed by Dr- Ing Richard Vogt, in order to reduce both hydrodynamic and aerodynamic drag. Other novelties proposed included electrically-actuated retractable floats arranged to split vertically, each half rotating through a 90-deg arc to lie flush within the wing, and a part- servo and part-manual control system. The structural design was conventional except insofar as it incorporated the fuel- carrying tubular mainspar that had been developed by Dr-Ing Vogt while working in Japan, this being sub-divided by bulkheads to accommodate six 759 Imp gal (3 450 1) fuel tanks, and carrying via welded steel-tube extensions the six BMW 132H nine-cylinder radial engines by which it was proposed that the massive flying boat was to be powered. Detail structural design began in January 1938, the designation Ha 222 initially assigned to the flying boat having meanwhile been changed to BV 222 with the change in the title of the Hamburger Flugzeugbau to that of Abteilung Flugzeugbau der Schiffswerft Blohm und Voss. The first metal was cut during the course of the year at Wenzendorf, near Hamburg, while work began on a larger, more modern facility at Finkenwerder where it was proposed that assembly should take place. Despite the commencement of hostilities in September 1939, work on this ambitious commercial flying boat continued unallayed, and on 16 July 1940, DLH representatives inspected a full-scale mock-up of the interior, although it was becoming obvious that the airline stood little chance of adding the BV 222 to its fleet. Dr-Ing Richard Vogt, leader of the BV 222's design team, revealed that the BV 222 was intended from the outset as the forerunner of an even larger machine (ie, the BV238) and that the servo-tab control system was selected in preference to an even more sophisticated power assistance system as it was likely to give less production repeatability trouble, a lower maintenance load and a more desirable method of emergency operation. In fact, the system was not pure servo-tab control, but part servo and part manual. Each aileron was divided into two unequal sections, the large inboard section being fitted with a servo-tab which had a follow-up ratio of 0.6, both aileron and tab being aerodynami-cally balanced and the balance system consisting of Blohm und Voss-patented "paddles" - differentially-controlled wind vanes previously employed by the tri-motored BV 138. The "paddle" balance permitted an adjustment of the force to apply aileron and also enabled the pilot to adjust the stick-free dihedral stability as required. The smaller outboard section of the aileron was operated by servo motor through a complex gearing action, but with the linkage direct to the pilot's control wheel, while its trim tab was operated from the cockpit through rotating rods. Thus, both aileron sections moved in unison in response to the controls under normal circumstances, and in the event of the control linkage being severed, both sections were designed to float neutral. Each elevator was divided into three sections, the outboard section being used only for trimming and operated by an electric motor, the switch for this being adjacent to the flap control to ease the trimming out of pitching movements with the application of flap. The centre portion of the elevator was also driven by an electric motor, but was not connected to the pilot's wheel and had its tab locked central. This could be utilised as a normal power-operated surface activated by the electric motor, be operated by the auto pilot, moving according to the attitude of the aeroplane, or be disconnected from the motor and allowed to float in the trailing position. The normal flight crew was intended to comprise 11 members, consisting of two pilots, two flight engineers, a navigator, a radio operator and five gunners. The structure was conventional, apart from the 4 ft 9 in (1,45 m) diameter welded steel tubular wing spar which was sub-divided by bulkheads into six separate fuel compartments each with a capacity of 633.5 Imp gal (2 880 1) of Diesel K 1, the similar number of oil tanks each containing 37.4 Imp gal (170 1). The fuel tanks were pressure- filled from the front wing catwalk, which also gave access to the rear of the engines, and the tanks had to be filled in staggered sequence one, six, two, five, three and four, and with 220 Imp gal (1000 1) at a time so as to avoid the risk of capsizing. The six Junkers Jumo 207C Diesel engines each offered 1,000 hp at 3,000 rpm for take-off, with a maximum output of 750 hp at 2,500 rpm for 30 min at sea level for climb, and drove 10 ft 9 in (3,30 m) diam VDM-Schwarz wooden-bladed propellers. It appeared, however, that the Diesels developed insufficient take-off power to lift the fully laden boat within a reasonable distance and therefore provision had been made for the attachment of four solid-fuel take-off assistance rockets beneath the wings, the modus operandi being to fire the rockets after 10 seconds full throttle to get the boat over the "hump" speed, these burning for a half-minute and the cases then being jettisoned. Even in a lightly laden condition and at full power, the boat demanded a long run before it could be eased up onto the step, but once over the "hump" speed it soon lifted off smoothly at about 78 knots (145 km/h). The floats, each of which split vertically, each half folding upward to lie flat within the wing, had to be retracted as soon as the boat was airborne since the electrical process occupied some 20 seconds and had to be completed before the airspeed reached 121 knots (225 km/h). The flight deck, which was reached by a ladder from the lower deck, was spacious. The first pilot's seat had an armour shield moulded to the shape of the body, and the first flight engineer occupied a jump seat between the two pilots, while the second engineer had a station at the rear of the flight deck. Meanwhile, the BMW 132H engines had given place to Bramo Fafnir 323Rs which it was anticipated would be able to offer 200 hp more for take-off with the aid of methanol-water injection, and late in August 1940, the first prototype, the BV222 V1 Werk-Nr 365, was rolled out of the Finkenwerder factory, launched on the Elbe, and, on 7 September flown for the first time with Flugkapitan Helmut Rodig at the controls. Sporting the registration D-ANTE, the flying boat was airborne for 20 minutes, Rodig declaring himself generally satisfied with control response, but complaining of some slight directional instability and a tendency to porpoise during taxying. Flight testing continued from the Elbe, interspersed with brief periods in the Finkenwerder factory for modifications, and the basic flight test programme was virtually complete by December, when the river iced up. Testing was resumed in February 1941, and plans were laid for a series of long-distance flights to demonstrate range and endurance. At this stage, the Luftwaffe proposed that these flights should also be supply missions. Cargo doors were therefore cut in the sides of the hull and the interior rearranged to accommodate bulky items of freight. With the civil registration replaced by the radio callsign CC+ EQ, and now wearing full Luftwaffe markings and camouflage, the BV 222 V1 flew its first supply mission on 10 July 1941. The BV 222 flew from Hamburg to Kirkenes, Norway, on the Barents Sea, six more flights between Hamburg and Kirkenes being flown by 19 August, totalling some 18,600 miles (30 000 km), about 650 tonnes of freight being carried to Kirkenes and 221 casualties being transported back to Hamburg. While the first prototype was engaged in its proving flights between Hamburg and Kirkenes, the second prototype commenced its test programme from the Elbe, this, the BV 222 V2 Werk-Nr 366 CC + ER, taking-off on its maiden flight on 7 August 1941. 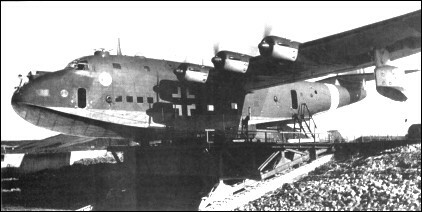 The decision had meanwhile been taken to place the second and subsequent BV 222s at the disposal of the Fliegerfuhrer Atlantik, established in the previous March, additional hulls being laid down for the long-range recon-naissance role in collaboration with U-boats, and the V2 having been completed with full defensive armament. This armament comprised a single 7,9-mm MG 81 machine gun in the bow, fore and aft upper turrets each mounting a single 13-mm MG 131, four MG 81s firing from beam positions in the hull, and one forward- and one aft-firing MG 131 in each of two gondolas mounted beneath the wing and between the outer engine pairs. In the event, trials with the V2 at Travermunde revealed that the drag penalty incurred by the gondolas was greater than could be accepted by what was already tacitly admitted to be an underpowered aircraft, and these appendages were promptly removed. Other modifica-tions directly resulting from the Travermunde test programme included the deepening of the rear hull step by the simple expedient of adding a wedge-shaped auxiliary structure, the addition of five short auxiliary steps immediately aft of the first main step, and some structural strengthening. The BV 222 VI resumed its long-distance flights on 10 September 1941, after overhaul at Finkenwerder, these commencing with a mission to Athens from where it was supposed to operate a shuttle service to Derna, Libya. Before this service could begin, however, the flying boat was forced to return to Finkenwerder to have a thick layer of barnacles scraped from its hull. During the period 16 October to 6 November 1941, the BV222 V1 made 17 return flights between Athens and Derna, carrying 66,140 lb (30000 kg) of freight and evacuating 515 casualties. During these flights, a maximum speed of 239 mph (385 km/h) was recorded at 14,765 ft (4500 m), and it was ascertained that up to 72 casualty stretchers or 92 fully equipped troops could be accommodated. Totally unarmed, the BV 222 VI was normally escorted by two Bf 110s, but occasionally the fighters missed the rendezvous and the flying boat had to fulfil its mission unescorted. On one such occasion, the lone BV 222 encountered two patrolling RAF Beauforts, but for some reason these did not attack the defenceless flying boat. In November 1941, the BV 222 V1 returned to Finken-werder to have defensive armament fitted, this being similar to that already mounted by the V2 apart from the underwing gondolas. Bv 222 VI was fitted with seven single 7.92mm and 13mm machine-guns, and under each wing a gondola mounting a pair of the latter. The BV 222 V3 Werk-Nr 439 DM + SD, first flown on 28 November 1941, possessed no armament other than the MG 81 in the bow position, this third prototype being intended purely for the transport role, which, for some time, was also to be the task of the BV 222 V2. On 20 January 1942, the BV 222 flying boat was officially named Wiking (Viking) by the Reichsminister der Luftahrt, and by this time a pre-production batch of five aircraft had reached advanced stages on the Finkenwerder final assembly line. It was envisaged that these boats, powered by Bramo Fafnir 323R-2 radials and considered as A-series machines although allocated Versuchs numbers V4 to V8 inclusive, would serve in both transport and maritime reconnaissance roles. In the event, the fourth of the A-series boats, the V7, was to be modified during construction to take Diesel engines as a C-series prototype. Ultimately, the Bv 222 V7 prototype was selected as the official production model for the military Bv 222 and appeared with the definitive "Bv 222C" model designation form. The earlier prototypes (V2, V3, V4 and V5) pressed into military service became maritime reconnaissance platforms, differing mainly in defensive armament and some mounting FuG 200 series search radar systems while flying for Fliegerfuhrer Atlantik. 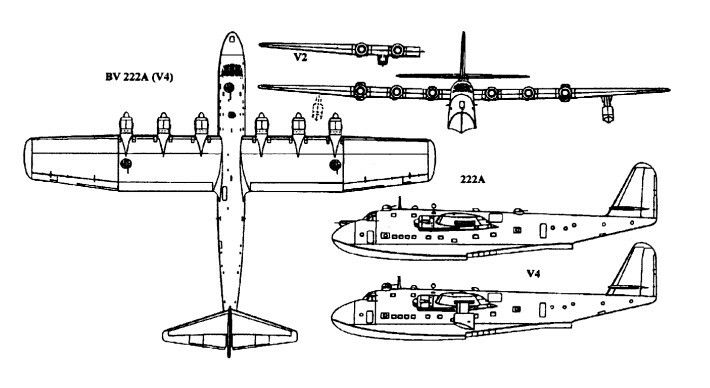 Bv 222B was a proposed variant to fit Junkers Jumo 208 series engines but never materialized. On 9 December 1941, the BV 222 V3 had been officially taken on strength by the Luftwaffe and, as the entire aircraft complement of Lufttransportstaffel See 222 V3, had under- taken 21 supply flights between Italian bases and Tripoli in the period January-March 1942. The BV 222 V3, by now coded X4 + CH, was joined on 20 April 1942, by the BV 222 V4 X4+13H, and the unit was redesignated Luftverkehrsstaffel “C”. The BV 222 V4 Werk-Nr 0004 (originally DM + SE) had been completed earlier in the year at Finkenwerder, and embodied some strengthening of the rear hull and the outer wing panels, and a redesigned, longer-span tailplane. On 10 May, the BV 222 VI was returned to service after modification and overhaul at Finkenwerder, being assigned to Luftverkehrsstaffel "C", which then became Lufttransport- staffel See 222, or LTS See 222, but the complement of the unit remained unchanged owing to the re-assignment of the V3 to the 3Staffel of Kustenfliegergruppe 406, a BV 138-equipped unit operating from Biscarosse, for the maritime recon-naissance mission. The complement of LTS See 222 was increased in August, however, with the arrival on the 10th of the BV 222 V2 (now X4 + BH) and the BV 222 V6 Werk-Nt- 0006 X4 + FH on the 21st. The four boats were primarily engaged on flying supply missions from Italian and Greek bases to Rommel's Afrika Korps, alighting at Tobruk and Derna, and returning with casualties, and were joined on 26 October by the BV 222 V8 Werk-Nr 0008 X4+HH, but a month later, LTS See 222 suffered its first casualty when the BV 222 V6 was intercepted and shot down by RAF fighters on 24 November when flying unescorted south of Pantelleria. This loss resulted in orders that BV 222s would subsequently fly all missions in formation at low altitude. Despite this precaution, on 10 December, the BV 222 V1, V4 and V8 were intercepted by a trio of RAF Beaufighters while flying in formation at low altitude over the Mediterranean en route to Tripoli. The BV 222 V8 was shot down and the V4 suffered heavy damage but succeeded in reaching Tripoli in company with the V1. The BV 222 VI foundered in the harbour at Athens in February 1943 when it struck a marker buoy at speed, ripping several yards of skinning from its planing bottom. LTS See 222 was therefore stood down and the surviving Wikings returned to Traverniinde for re-arming and other modifications. The fact that the BV 222 was manifestly underpowered had been a matter of considerable concern to the Blohm und Voss team from an early stage in the development of the flying boat. The A-series boats were not, in fact, to be equipped with the planned methanol-water injection system for boosting take-off power until the summer of 1942, and then the maximum permissible take-off weight was raised from 99,206 lb (45 000kg) to 105,820 lb (48 000 kg). The Bramo Fafnir 323R-2 engines each afforded 1,000 hp at 2,500 rpm, 800 hp at 2,250 rpm and 640 hp at 2,100 rpm, MW 50 boosting take-off power to 1,200 hp. From the outset, Junkers Jumo Diesel engines had been favoured for their economy, although in service such engines were proving temperamental and demanding on skilled maintenance. The definitive model planned for DLH had been the BV 222B with six Jumo 208 Diesel engines each rated at 1,500 hp at 2,800 rpm and 1,000 hp at 2,500 rpm, but Junkers had failed to take the Jumo 208 beyond the bench-testing stage. Proposals originally made to the RLM in 1939, which included Projekt 97 with six BMW 801 air-cooled radials and Projekt 98 with four BMW 801s, were resurrected, but the RLM was adamant that such engines be reserved for other aircraft types. Finally, the Technische Amt of the RLM accepted Blohm und Voss's proposals that Jumo 207C Diesels affording 1,000hp at 3,000 rpm be installed in the fourth A-series flying boat, the BV 222 V7, Junkers promising a further development of this engine, the Jumo 207D with MW 50 boost which would provide the desired short-term take-off power, for installation in later production boats. The BV 222 V7 was intended from the outset primarily for the long-range reconnaissance role. Fuel tank capacity was decreased, each of the six mainspar tanks accommodating 633.5 Imp gal (2 880 1) of Diesel K 1 as compared with the 759 Imp gal (3 450 1) of gasoline of the A- series aircraft tanks, the capacity of the six oil tanks each being raised to 37.4 Imp gal (170 lt) from 19 Imp gal (861 lt). Normal loaded weight was 101,390 lb (45990 kg) and maximum overload weight was 108,026 lb (49 000 kg), and at neither weight did the Jumo 207C Diesels deliver sufficient power for take-off without an excessively long run. Provision was therefore made for the attachment of four solid-fuel take-off rockets beneath the wings, these being fired after 10 seconds at full throttle and burning for 30 seconds. The surviving BV 222 flying boats had meanwhile standardised on a revised defensive armament which now incorporated a forward dorsal turret with a 20-mm MG 151 cannon, a similar weapon in each of two turrets mounted in the wings immediately aft of the extreme outer engine nacelles, a 13-mm MG 131 machine gun firing from a forward beam position and two 7,9-mm MG 81s from aft beam positions, the aft dorsal turret and the bow gun being deleted. The BV 222 V7 reinstated the bow position, however, adding an additional forward beam MG 131 and supplanting the rear beam MG 81s with MG 131s. Furthermore, it featured repositioned wing turrets which were now situated in the rear ends of engine nacelles two and five. Search radar was fitted and additional radio aids included FuG 200 Hohentwiel, FuG 16Z VHF radio with direction and range measuring facilities, FuG 25a IFF, and an FuG 101a radio altimeter. An ETC 501 rack was fitted to carry an FuG 302c Schwan (Swan) beacon. Similar equipment was simul-taneously installed in the remaining A-series boats as it had become obvious that Axis resistance in North Africa was collapsing and that the BV 222s would be best employed in co-operation with the U-boat fleet in the Atlantic under the control of the Fliegerfuhrer Atlantik. The Diesel-engined BV 222 V7 Werk-Nr 0310007 TB + QL flew for the first time on 1 April 1943 as the prototype of the C- series, work on several pre-production examples of which had been initiated some time before the completion of the last A- series aircraft, the BV 222 V8. In fact, the BV 222C-09 Werk- Nr 0310009 was completed only six weeks after the V7 and was actually to precede the Diesel-engined prototype into service with the Fliegerfuhrer Atlantik, being taken on strength by Aufklarungsstaffel See 222 on 23 July 1943. This unit had been formed in May with the V2, the V3, the V4 and the V5 as a component part of 3./Ku.Fl.Gr.406, but had lost two of the boats, the V3 and the V5, in the following month when they were strafed and sunk at their moorings at Biscarosse. The BV 222C-09 differed from the V7, which was to join Aufklarungs-staffel See 222 on 16 August 1943, essentially in the positioning of the defensive wing turrets, these being located slightly further forward and between the outboard engine pairs, and extended beneath the wing to provide adequate leg room for their gunners. The BV 222C-010 Werk-Nr 031 0010 had been added to the Biscarosse-based unit by October 1943, when the Aufklarungs-staffel See 222 was redesignated 1.Staffel of (Fern)/See- Augklarungsgruppe 129, its flying boats ranging far out over the Atlantic on U-boat co-operation tasks, and in October 1943, one of the BV 222s encountered and shot down a patrolling Lancaster. The BV 222C-011 and C-012 followed the C-010 from the Finkenwerder factory at short intervals, the time to build a hull in the gantry having by now been reduced to six weeks by dint of working shifts around the clock, the complete airframe being produced in an average of 350,000 manhours, the detail manufacturing and sub-assembly being mainly undertaken at the Steinwerder branch factory. The BV 222C-013 was the first airframe in which it was proposed to install the more powerful Jumo 207D Diesels as the prototype BV 222D, but as these failed to materialise, the boat had to be completed with the lower-powered Jumo 207C engines. Four additional airframes had been under con-struction which it had been intended to complete as BV 222Ds, but, meanwhile, the RLM had ordered the cessation of further development and production of Diesel engines and, failing the availability of more suitable power plants, Blohm und Voss had no recourse but to revert to the Bramo Fafnir 323R-2s of the A-series. With these radials installed it was intended to designate the four additional boats as BV 222Es, but in the event, early in 1944, it was concluded that the aircraft industry could no longer afford the large labour force demanded by the BV 222, the production programme being cancelled and the four boats under construction being scrapped. The 1.(F)/SAGr. 129 continued operations from Biscarosse, losing the BV 222C-010 to RAF night fighters early in 1944, but in July, following the D-Day landings, the unit was disbanded, the four BV 222s remaining on strength being reassigned to the Stab and L(F)/SAGr.130 and 2. (F)/SAGr.131, the former being primarily BV 138-equipped and the latter operating a mix of BV 138s and Ar 196As. As the war situation progressively deteriorated, the BV 222s were increasingly relegated to transport tasks and only one other example, the BV 222C-09, was lost to enemy action before fighting terminated in Europe, this being strafed and damaged beyond repair by RAF fighters at Travermunde early in 1945. Of the boats that survived the conflict, the BV 222 V2 was blown up by British forces in Norway, the V4 was blown up by its own crew at Kiel-Holtenau, the V7 was destroyed by its crew at Travemunde, the C-011 and C-013 were captured intact by US forces and taken to the USA for evaluation, and the C-012, was captured by British forces in Norway and flown to the UK. Internal fuel capacity, 759 Imp gal (3 450 1) in each of six tanks. Wing area, 2,744.8 sq ft (255 sq.m). Engines: Six Junkers Jumo 207C six-cylinder two-stroke. Engines: 6 x Junkers Jumo 207C 12-cylinder diesel, 1,000hp each.